Register Today! biztimes.com/2035 “Competing in a New Era of Innovation” Join us on April 26th as author Greg Satell (1) shares his insights on how the new era of innovation is transforming connections and interactions with customers, partners, vendors and employees. Greg is a popular author, speaker, and trusted adviser whose new book, Cascades: How to Create a Movement that Drives Transformational Change, will be published by McGraw-Hill in April, 2019. His previous effort, Mapping Innovation, was selected as one of the best business books of 2017. 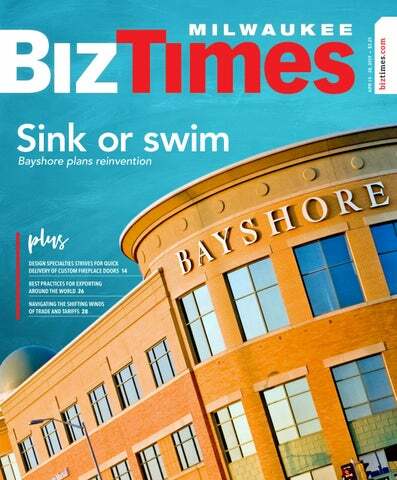 BizTimes Milwaukee (ISSN 1095-936X & USPS # 017813) Volume 25, Number 2, April 15, 2019 – April 28, 2019. 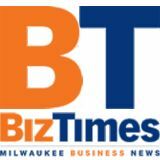 BizTimes Milwaukee is published bi-weekly, except monthly in January, July and December by BizTimes Media LLC at 126 N. Jefferson St., Suite 403, Milwaukee, WI 53202-6120, USA. Basic annual subscription rate is $42. Single copy price is $3.25. Back issues are $5 each. Periodicals postage paid at Milwaukee, WI and additional mailing offices. POSTMASTER: Send all UAA to CFS. NON-POSTAL AND MILITARY FACILITIES: Send address corrections to BizTimes Milwaukee, 126 N. Jefferson St., Suite 403, Milwaukee, WI 53202-6120. Entire contents copyright 2019 by BizTimes Media LLC. All rights reserved. 12	Biz News 12	C AN MILWAUKEE HANDLE THE DNC? 14	MADE IN MILWAUKEE 15	TAKE TIME TO LOOK AHEAD AT WAUKESHA 2035 EVENT. Coverage includes a report on best practices for international export, and insights on navigating the shifting winds of trade and tariffs. FUNDING: Wrapping up $400,000 pre-seed round; plans for a seed round in the fall. NEX T GOAL: Get the product to market and establish product-market fit. A recent survey of BizTimes.com readers. The latest area economic data. the highest among the 50 largest metro areas. Share your opinion! Visit biztimes.com/bizpoll to cast your vote in the next Biz Poll. passengers in 2018, a 3.6% increase over 2017 and a new record for the line. in March, down from 55.09 in February. Any reading greater than 50 indicates growth. down about 7% from about 2.57 million in 2017. FRAN C H I S E E GYMGUYZ vans carry workout equipment such as dumbbells, medicine balls and TRX bands. GYMGUYZ trainers lead small group boot camps at various public locations throughout the area. “I was trying to figure out what would fit within my skill set as well as be something that I would be proud of presenting on a daily basis,” Corsi said. THE FRANCHISE: Plainview, New York-based GYMGUYZ is a mobile fitness company that offers in-home personal training services to people of all ages and athletic abilities. GYMGUYZ trainers bring the gym to their clients, traveling by vans equipped with 365 mobile fitness tools used to lead hour-long training sessions and health assessments. CEO and founder Josh York first launched the business in 2008, and it has since grown to employ approximately 400 trainers, operating 200 vans in 27 states and two countries. SUMMER 2017 Scott Rossman, who also owns Bronzer Image Tanning in Hartland, becomes interested in buying into a franchise and hires a consultant to help with the research and decision process. Meanwhile, Scott Corsi, who has almost 20 years of business experience, is also exploring franchise opportunities. DECEMBER 2017 Both Rossman and Corsi, who at the time did not know one another, decided to buy in to the GYMGUYZ brand, launching the company’s first two franchise territories in Wisconsin. Corsi owns the company’s Milwaukee-area franchise and Rossman co-owns its Greater Waukesha County franchise. Rossman and Corsi first connect just before traveling to New York together for a weeklong training session at GYMGUYZ corporate headquarters. LATE SUMMER 2018 Rossman and Corsi team up to hold a boot camp event at The Corners of Brookfield as one of their first collaborations. Although they cover separate areas, Rossman and Corsi said they often work together on marketing opportunities and touch base almost every day to discuss a range of business-related topics, including employee relations, promotions and pricing. Between the two of them, Corsi and Rossman employ seven trainers and have two vans. They plan to collaborate on efforts to expand their in-home training services to senior living facilities and corporate settings. “We help each other along in terms of setting benchmarks, not only for ourselves but then, discussing each other’s territory and seeing what’s effective and what’s not effective,” Rossman said. IT director – CISO, Briggs & Stratton Corp.
Join us on May 30th as we kick off the 15th annual BizExpo. BizTimes Managing editor Molly Dill will lead a discussion with four of the regionâ&#x20AC;&#x2122;s business and community leaders on the various paths each has taken in her career. Youâ&#x20AC;&#x2122;ll hear about the drive, curiosity and leadership skills they leveraged to choose new roles that have allowed them to continue to grow and have fulfilling careers. From corporate to entrepreneur to nonprofit, each of the panelists made a conscious decision to change her career path. Listen as they discuss the opportunities, setbacks and lessons learned from changing industries and careers. Host committee chair Alex Lasry, DNC chairman Tom Perez, Milwaukee Mayor Tom Barrett and Lt. Gov. Mandela Barnes, along with other city and party leaders, celebrate after announcing that Milwaukee will host the 2020 Democratic National Convention. of Commerce, Gavin Hattersley of MillerCoors LLC, David Jacobson of BMO Financial Group and John Donofrio of Johnson Controls International plc. “The response I’ve gotten from the business community is that this is not a partisan affair, this is a civic affair… and they understand you invest in a community in order to get visitors,” Barrett said. The committee has also continued to recruit and register local, diverse businesses for its Supplier Diversity Initiative, an effort led by local DNC activists Jason Rae and Martha Love, Lasry said. Those businesses will be included in a directory provided to convention organizers as they start to plan the upwards of 1,500 related events set to take place at venues throughout the city. “They’re going to need any type of vendor to make sure that they’re able to put on their events,” Lasry said. “…We want to make sure the contracted businesses are as local and as diverse as possible.” The initiative so far has held five informational meetings, with more planned for the next few months, Lasry said. In addition to contractors, 12,000 volunteers will be recruited from across the state to serve during the convention as local resources for attendees and to help the event go off without a hitch, Lasry said. dishes using McDonald’s ingredients. SHARP Literacy provides STEAM-integrated literacy programs to 8,500 urban elementary students in Milwaukee and Waukesha County. Milwaukee-based Design Specialties makes custom glass fireplace doors. ly, and when most processes are not repeated exactly the same way each time, it is difficult to automate them. The company has counteracted those challenges by keeping as many processes in-house as possible and focusing on lean implementation. Standardizing workstations, for example, allows a well-trained employee to assemble eight to 10 steel doors or 35 to 45 aluminum doors per day. Howard said the company has also found some areas where automation does help. A packaging machine helps prepare boxes perfectly sized for each door and the company is exploring ways to add CNC machining capabilities. Sales of fireplace doors are particularly seasonal, Howard said, with the busy months running from October to March. The slowdown in the late spring and summer gives the company time to refine its systems, install new machinery, perform maintenance and make floor plan changes as needed. Westmoor Country Club - 400 S. Moorland Rd. - Brookfield, WI 53005 Anguil Environmental Systems is celebrating over 40 years in business as a worldwide leader of industrial air pollution control and wastewater treatment technologies. The Anguil’s will share how creating a strong family culture created a vision for the future and positioned their company for success for the next generation. Northridge Mall, located at 9009 N. Granville Station Road on Milwaukee’s far northwest side, has largely sat vacant since the shopping center closed in 2003, but has received plenty of attention in the years following. In 2013, Bill Penzey, owner of Penzeys Spices, tried to buy the mall property out of foreclosure from its current owners, China-based U.S. Black Spruce Enterprise Group Inc., and planned to move the company’s corporate offices there. However he was never able to acquire the entire mall and eventually gave to the city the portion he did own, the former Boston Store building at 8919 N. Granville Station Road. City officials plan to demolish that building in hopes it will lead to industrial development at the site. And in 2017, Menard Inc. purchased the vacant Pick ’n Save building at the former Northridge Mall site and expanded its presence there. Menards is the only store open at the former mall site. The fate of the rest of the unused mall is uncertain. WHAT UNITES US, IGNITES US Making Strides Against Breast Cancer of Milwaukee 05.11.2019 Walk in our Making Strides Against Breast Cancer of Milwaukee this spring, and help save lives. The dollars you raise fund breast cancer research and help patients get free rides to chemo, free places to stay near treatment, a live 24/7 cancer helpline, and so much more. United, we can make a bigger impact on breast cancer. MEET YOUR FUTURE CUSTOMERS AT WISCONSIN’S LARGEST ONE-DAY BUSINESS EVENT. 14 West 360 Direct Inc. ActionCOACH of Elm Grove Acuity Insurance AFLAC All Pro Resources Applied Tech BizTimes Media Butters-Fetting Co., Inc. Carefree Boat Club of Wisconsin Casino Party Planners Central Office Systems Charles Schwab Citizens Bank Commerce State Bank Computer Technologies, Inc. Concordia University Engineered Security Solution, Inc.
Can Your Business Survive an IT Attack? shopping centers. But after 12 years of ownership changes, a global financial crisis and major shifts in the retail industry, the mall seems to have lost its sparkle. Two of its major anchors have disappeared and other brick-and-mortar stores and restaurants have followed, leaving Bayshore with more than 50 available tenant spaces. In 2017, New York-based AIG Global Real Estate Services, acquired the mall in a deed-in-lieu-of-foreclosure transfer, and has since promised to breathe new life into the troubled mall with a $75 million redevelopment plan that is set to take off soon. Now, in the midst of a disrupted retail industry driven by the rise of e-commerce and the decline of brick and mortar, Bayshore stands at a crossroads as it tries to adapt. FIRST REDEVELOPMENT Glendale’s Bayshore Town Center, which first opened in 1954 as Bay Shore Shopping Center, was the first regional shopping center in the state to shift away from its standard format, transitioning from an enclosed 500,000-square-foot retail structure to an outdoor pseudo-city with 1.2 million square feet of mixed-use offerings. The massive redevelopment, led by Columbus, Ohio-based developer Steiner & Associates, was aimed at giving Bayshore a pedestrian-friendly, downtown feel. At its 2006 opening, it added to the site 11 new buildings, a grid of city streets and a central public square for hosting year-round community events. It also added an indoor central rotunda with space for entertainment. Existing anchor stores Sears, Boston Store and Kohl’s remained, but were now complemented by high-end brick-and-mortar tenants including J.Crew, Brooks Brothers and Vera Bradley, as well as restaurants such as California Pizza Kitchen, The Cheesecake Factory and Devon Seafood + Steak. The area’s first Trader Joe’s location, an Apple store, an iPic Entertainment movie theater and bowling alley, and an LA Fitness also joined the lineup, helping Bayshore compete with other area malls, like Mayfair in Wauwatosa, which had dominated the local retail scene. And with the addition of office space and residential units, Bayshore could attract more shoppers and boost sales, which averaged $300 per square foot (compared to Mayfair’s $500) before the redevelopment, according to a 2009 case study by ULI Development. now that are going on – the evolution of e-commerce and Amazon and digitally native brands,” said Cory Sovine, senior vice president of retail at Colliers International in Milwaukee. As the ease of online shopping and the rise of Amazon took the place of brick-and-mortar shopping, numerous anchor stores and large retailers were forced to close locations or to shut down completely. And as a result, regional malls everywhere were taking a hit. For Bayshore, that meant losing Sears in 2014, Sports Authority in 2016 and most recently, Boston Store, which closed in 2018 as a result of Milwaukee-based The Bon-Ton Stores Inc.’s liquidation. Smaller, more specialized retailers have also been affected. Over the past few years, Bayshore has lost Vera Bradley, J.Crew, Teavana, American Eagle, Shaw’s Jewelers, Charlotte Russe, Payless ShoeSource, Abercrombie & Fitch and Gymboree, among others. “As you see a lot of these generational retailers such as the Sears and the Bon Tons and the Gaps, Abercrombie & Fitch and all these other retailers that had been there, it’s not necessarily reflective of the mall, but they’re just kind of obsolete retailers right now,” Sovine said. “Many of them are bankrupt or in the process of going bankrupt.” In addition, restaurants Hom Wood Fired Grill and Sprecher’s Restaurant & Pub have shuttered within the past year, and iPic Entertainment closed its movie theater and bowling alley in 2018. A NEW PURPOSE The underlying vision for the project, Williams said, is to position Bayshore as a community gathering place, which is part of the experience people can’t get from shopping online or communicating with their smartphones. Tenants that will continue operating at Bayshore after the redevelopment – Cypress’ plan lists a lineup of 40 businesses, including Athleta, Brooks Brothers, Trader Joe’s, Forever 21 and The Cheesecake Factory – along with new stores that will join the roster, such as Total Wine & More, will reflect the evolving tastes and preferences of consumers, Sovine said. ern by Marcus cinema. No such plans have been in the works for Bayshore, which Sovine suspects is likely a reflection of the mall’s previous ownership and its lack of capital to make an investment of that size. And as the current ownership works to redevelop the mall, it will be more cost effective for them to have large blocks of vacant space to work with, he said. maining $56.6 million in outstanding tax financing debt and invest a total of $75 million in the new Bayshore redevelopment project, according to city documents. “They see that there is a lot of great opportunity here and they want to tap into where the market is headed over the next 10 to 20 years so that the kind of development that they do is the kind of development that is sustainable and profitable year after year,” Kennedy said. He said Bayshore’s previous owners had never defaulted on their annual bond payments, but considering its struggles over the past decade, the city started to question the mall’s ability to pay off the bonds in time. So when AIG rolled out plans to invest in the property and pay off the debt from the original project, the city loved the idea, Kennedy said. The next step for the city is reassessing Bayshore at its fair market value, Kennedy said. Currently, the mall is assessed at $310 million. In the early 2000s, before it was redeveloped, it was valued at $70 million. The mall’s reassessment will be part of a citywide assessment of all 7,000 Glendale properties, which is set to take place over the next few months, Kennedy said. Although the original timeline has changed, Kennedy expects Bayshore will one day fulfill its original purpose of generating more revenue for Glendale. That could help lower property taxes and fund capital infrastructure and improvements. Marquette University/the University of WisconsinMilwaukee/Northwestern Mutual Life Insurance Co.
tentially altering how to prepare or who to bring to a meeting. “It’s important to understand those cultural nuances,” she said. Cornell pointed out things like exchanging a business card in China or seeking payment in Latin America are done much differently than in the U.S. Taking the time to learn local norms or the proper pronunciation of a name can go a long way. “You’ve got to start off respecting their norms,” he said, noting that even getting something wrong but showing an effort to do it properly will help. With targeted markets identified and an appreciation for cultural differences, companies can set about the task of finding new business. However, Paul Byrne, global vice president of sales and marketing at Menomonee Falls-based Bradley Corp. said those new to exporting should expect things to take a little longer than planned to develop. “You have to have patience and this is the hardest thing for senior leadership,” Byrne said during a panel discussion at the Manufacturing Matters conference presented by WMEP. “If your CFO is looking for a hard nuts ROI, it’ll come, but it won’t come early.” Byrne said part of the return on investment comes from lessons learned in international markets that can be applied in the domestic part of the business, including new product ideas, process improvements or just ways of doing business. Work with Exporting Experts to Develop Your Plan Congratulations to ExporTech™ Alumni, Gamber-Johnson & Hydro-Thermal, 2018 winners of the President’s “E-STAR” award! This award is only given to previous “E” award winners who demonstrate an additional four years of revenue increases. The dining room of a western hotel at noon in the Chinese city of Changzhou. A SELECTION OF SOUTHEASTERN WISCONSINâ&#x20AC;&#x2122;S FINEST HOMES FOR SALE, COOL CARS, LUXURIOUS REMODELING PROJECTS AND TALES FROM DREAM VACATIONS. This premier Lake Geneva estate sits on 3.5 manicured acres with 210 feet of lake frontage, located within walking distance of town. Built in 2009, the roughly 13,000-square-foot home totals 25 rooms in all, including 13 bedrooms and 13 full bathrooms. Features include a gorgeous white kitchen with two islands and a separate breakfast room, as well as a library, an exercise room, an expansive veranda overlooking the lake and in-ground pool, and a resort-sized pier. It is listed for sale by Anne DuBray with Coldwell Banker Residential Brokerage. The 16,000-square-foot Minnewoc mansion is a replica of Anne Boleynâ&#x20AC;&#x2122;s castle built in 1892. The home was completely renovated in recent years, including a large addition in 2014. The 7.2-acre property includes more than 800 feet of lake frontage. The high-tech home can be run off a tablet, including the temperature and lights. It also has 73 solar panels on the roof. Six bathrooms, four half bathrooms and six bedrooms are included. It is listed for sale by Jon Spheeris with Coldwell Banker Elite. Another Lake Geneva beauty, this 5,500-square-foot home offers a view all the way to Fontana from Geneva Bay. In addition to the 139 feet of lake frontage and private pier, this home features an infinity edge pool with diving board and slide, a hot tub and a gazebo. The living room boasts beamed cathedral ceilings, a stone fireplace and floor-toceiling windows. If you need to practice your swing, thereâ&#x20AC;&#x2122;s a golfing simulator located in the additional finished building. It is listed for sale by Sal Dimiceliâ&#x20AC;&#x2122;s team with Lake Geneva Area Realty Inc. This Treasure Island Drive home was designed and built to accommodate gatherings both large and small. The 11,000-square-foot home sits on a nearly 3-acre lot, including more than 200 feet of lake frontage. Entertaining guests is made easy with a grand front entry, stone patios with dipping pools and easy access to the lake. It includes five full bathrooms, two half bathrooms and five bedrooms. It is listed for sale by Karen Trimble with Keller Williams. The University Club Tower offers a world of amenities and picturesque views of the city. This nearly 3,700-square-foot, two-bedroom and two-bathroom condo is completely customized with an eye toward modern living. For those looking for a home as smart as they are, this condo has extensive home automation. Other highlights include eightfoot interior doors, an open-concept kitchen and gleaming hardwood floors. It is listed for sale by Andrea Woda with Mahler Sotheby’s International Realty. With this house, you also get a piece of history. The Fred Miller estate, once home to the founder of Miller Brewing Co., is a historic Victorian mansion that is situated on a bluff overlooking Oconomowoc Lake. Built in 1871, the nearly 10,400-square-foot home comes with 11 bedrooms, five bathrooms and a large screened-in front porch. It is listed for sale by Jon Spheeris with Coldwell Banker Elite. 109 Raven Turn E, Wind Point This elegant lakefront home sits on nearly 2 acres, with 233 feet of Lake Michigan shoreline, offering homeowners their own private sand beach. Expansive windows on the east side of the six-bedroom, six-bathroom home provide views of the lake from almost every room. The windowed doors in the dining room slide open to a screened porch. There is plenty of space for entertaining, including a game room, built-in bar and party room. It is listed for sale by John Crimmings of First Weber. 3266 N. Lake Drive, Milwaukee This Lake Drive mansion, designed by architect Alexander C. Eschweiler, is modeled after the Chateau dâ&#x20AC;&#x2122;Azay-le-Rideau in Franceâ&#x20AC;&#x2122;s Loire Valley. The roughly 9,200-square-foot home, built in 1912, offers a regal front with lake views in the back. Visitors will admire the vaulted ceilings in the family room and the attention to detail in the remodeled great room. The grand staircase leads to the master suite with attached dressing room. It is listed for sale by Melanie Gilmore-Gaar of First Weber Inc.
W151N7314 Paseo Lane, Menomonee Falls Every detail in this custom-built home, built in 2016, was carefully selected with a top area designer. Some features of the 8,800-squarefoot home include a striking foyer with hand-forged iron curved staircase, heated acacia hardwood floor in the great room and a temperature-controlled wine room on the main level. The pub wing features barnwood floors, a bar and a family room that flows to the screened porch. It is listed for sale by Mary Deeken of First Weber Inc. This two-story custom brick colonial was built with careful attention to detail by one of the developers of Vintage Estates. This home has a two-story grand foyer with double elliptical staircase, marble floors and a large chandelier welcoming guests into the one-of-a-kind residence. The second floor of this nearly 7,000-square-foot home features an expansive master suite with fireplace, 15-foot vaulted ceilings and spa-like bath. It is listed for sale by Lisa Ashley with Mahler Sotheby’s International Realty. Flying private aviation for over 70 years with ﬂights out of Milwaukee, WI, Madison, WI, Green Bay, WI and everywhere in between! 2008 Chevrolet Corvette Michael Berns | The Brickyard Inc.
U.S Route 66 sees travelers from all over the country, but one car definitely turned heads on the Mother Road. Michael Berns, who works in outside sales at masonry distributor The Brickyard Inc. in Milwaukee, drove his 2008 Chevrolet Corvette from Chicago to Santa Monica, California with his wife, Luann, in the passenger seat. The sleek black vehicle had no problem taking on the 19-day trip. Racking up more than 5,000 miles on the journey there and back, Berns was proud to showcase his beloved Corvette. Berns’ vehicle is loaded with a six-speed transmission, chrome wheels, five-spoke rims, a power top, 436 horsepower, and a top speed of 194 miles per hour. The car also features a white and black two-tone leather interior, making it one out of only 300 corvettes with this unique look. “My granddaughter dubbed it ‘Pengy’ for penguin for the black and white,” Berns said. Berns purchased the vehicle in 2016 online. After searching online and at dealerships for a corvette and never being able to find the right one, Berns decided to narrow down the search. He decided to look for a black Corvette after previously owning a black Chevelle and a black Camaro. When Berns finally found the perfect match, he recalls going home to his Luann and telling her, “I found a new girlfriend” and she responded, “You found a car?” The problem, however, was the car was in New Jersey. Berns and Luann planned to go on the Woodward Dream Cruise with the new car in a few weeks and didn’t have time to take a trip to go see the car in person. After extensive homework, Berns took a leap a faith and wired the money to the dealership in New Jersey, despite the bank’s warnings. The car was shipped to him in Wisconsin a few days later with show car quality finish and it’s been an affair ever since. “It isn’t a supercar by any stretch of the imagination,” Berns said. “But it is fantastic. It has enough horsepower for the average car enthusiast.” Berns was able to debut the car on the 2016 Woodward Dream Cruise, a classic car event that begins in Detroit, Michigan. He returned for the 2017 and 2018 cruises, as well. As for future cruises, Berns and his wife will be taking the Corvette on its first Hot Rod Power Tour in June. It is a seven-day, seven-city journey starting in Concord, North Carolina and ending in Norwalk, Ohio. It is the largest traveling car show in the world, bringing in more than 6,000 vehicles and 100,000 spectators. Berns covers his Corvette during the winter and unwraps it, twine and all, as the warmer season draws near. Lynn Tarrence, owner and lead designer at Milwaukee-based The Egg Design Group LLC, and her husband, Dan, bought their historic Milwaukee home about three years ago. While the whole house underwent an extensive makeover — infusing original details with modern conveniences and other enhancements — the kitchen is especially noteworthy. The original kitchen was rid of things like its large radiators on two walls and the massive icebox. But other things were kept and made into key features of the room, such as the silver washing sink in the wet bar that proudly displays all of its original dents. The space between the kitchen and dining room was opened up, with a roughly 36-inch doorway becoming a seven-foot opening. They also installed in-floor heating, natural stone countertops that look like liquid and a large chandelier. Tarrence said her favorite feature in the kitchen is the area that displays open live-edge wood shelves, which still have bark on their edges, being held up by galvanized plumbing pipe with caps on them. These shelves are placed next to an old chimney that was brought out from the walls to show off the cream city brick. Also displayed there is a piece of artwork the couple bought from a Milwaukee art gallery. “It was very fun to do, and I get tickled every time I look at it,” Tarrence said of that wall. Waukesha-based Swimming Pool Services Inc. was recruited by Pewaukee homeowners to completely re-envision their backyard pool area. They were unhappy with the existing fiberglass pool and felt like it looked like an afterthought to the home. The task was to make this area look like it was part of the original construction of the home and serve as a place to entertain guests. The pool was replaced with a vinyl-lined pool that better handles the freeze and thaw cycles of the Wisconsin climate. Also, the existing retaining walls, which were too short and did not prevent water from washing dirt into the patio area, were redone. The new retaining walls were pushed into the hill at the shallow end of the pool, and one part of the wall was kept shorter to create a seat wall. The entertainment space includes a barbecue island, a bar island, a covered area and a fire pit. Added to the pool was a diving board and sundeck. Without many options for the location of the homeowners’ desired covered area, the contractor decided to weatherproof the underside of an existing overhead deck. The covered area provided for a great location for a bar island. The covered bar area and main patio area made the space more functional by offering the family and guests other options for activities beyond just swimming. This new master suite was just one component of a wholehome remodel in Greendale that J&J Contractors I LLC performed for clients who loved their neighborhood and large private yard, but with an expanding family, needed more space. As part of this project, one objective was to expand the lower level to have a full basement, as the majority of the home only had a crawl space underneath. In expanding that crawl space, the original plan was to keep the existing back of the home intact and excavate below while lifting up the existing structure. Once construction began, it became clear the most effective way to perform this work would be to instead remove 900 square feet from the back of the home, excavate the basement and rebuild. However, this gave the clients the ability to redesign the main floor layout and add an extra bedroom, as well as design a true master bedroom suite, complete with a walk-in closet and bathroom. The suite features a tall, arched ceiling, with a chandelier light fixture hanging over the bed. And at the center of the master bathroom sits a large tub, with an additional large glass shower stall behind it. Other work performed on the house included opening up the main living space, adding a bedroom and bathroom, redesigning the existing play room and family room, and adding more entertainment space. AB&K Bath & Kitchen was tasked with transforming a Mequon homeowners’ basement into a “light, bright man cave.” What started out with dated cabinetry, appliances and countertops in a dark basement was turned into a bright, fresh and multi-functional space fit for many types of occasions. A storage closet located in the center of the basement had divided the large room into two smaller spaces. Removing that closet, as well as reorienting the bar, opened the basement into a true family entertainment area. The bar was recreated with white countertops that stood out in contrast to the dark, cherry-stained and more modern-looking cabinetry, which provided more storage space for different types of bar supplies and drinkware. Behind the bar, which can seat half a dozen people, the contractor added a sleek new beer and soft-drink fridge right underneath the countertop. Stacked stone accents on the front of the bar, around the column and on the back wall add a great texture to the space. Unique lighting accents the split-faced stone, and generally brightens the whole basement area. Near the bar area is now an expansive space to be used for wine storage with wine racks, shelves with similar materials to the bar cabinets and more tabletop space. Elsewhere, behind a wall of glass is a fitness area, equipped with weights, cardio equipment and plenty of open space for any type of workout. This is your annual opportunity to learn from those who are on the same journey as they strive to build wealth and create a lasting legacy. Reserve your space in the 2020 Giving Guide! MISSION The MACC Fund raises funds for research in Wisconsin for childhood cancer and related blood disorders like sickle cell disease and aplastic anemia providing a Gift of Hope Through Research. SERVICE AREA Research is supported at The Medical College of Wisconsin, Children’s Hospital of Wisconsin, the UW Carbone Cancer Center and Marshfield Clinic. The goal of the MACC Fund is to find a cure by providing funding for research. The MACC Fund raises money and benefits from a number of exciting events throughout the course of the year. Please visit www.maccfund.org as well as the MACC Fund Facebook page and the MACC Fund Twitter and Instagram accounts to keep up to date on what the MACC Fund is doing! The MACC Fund benefits from a number of exciting events throughout the year. Please visit www.maccfund.org and follow the MACC Fund on Facebook, Twitter and Instagram. VOLUNTEER OPPORTUNITIES Trek 100 volunteers manage rest stops, help on the routes and serve food to appreciative riders. Milwaukee Brewers Mini Marathon, 5K and 10K volunteers help in a number of ways. Volunteers play key roles soliciting items for events which they stage working with MACC Fund staff. Whatever the volunteer role, it has a common goal of helping the MACC Fund help children. Scott Falk (Treasurer) ★ Robert W. Baird & Co.
magazine, BizTimes Nonprofit Weekly enewsletter and BizTimes.com. The MACC Fund supports research for childhood cancer and related blood disorders like sickle cell disease and aplastic anemia. Thanks to generous supporters, the MACC Fund has contributed over $63 million to research in Wisconsin benefiting children throughout the world and helping the overall cure rate for childhood cancer to increase from 20% to 80% since the MACC Fund began in 1976, yet children can relapse and have “late effect” issues that require additional research. MACC Fund supported research impacts the treatment of children throughout the state, the nation and the world. GIVING OPPORTUNITIES The MACC Fund affords many giving opportunities whether as a volunteer, event participant, sponsor or generous donor. Donors can remember a loved one or honor a friend with a donation in their name. Donations can be made through company sponsored events corporate or individual giving. Gifts of securities and insurance as well as planned giving and estate planning are all vehicles that can be part of a Gift of Hope Through Research. by the Region’s Business and Philanthropic Leaders all year long. Don’t fear failure It’s okay to be human WHEN I TELL CEOS that they need to give themselves and their employees permission to be human, I sometimes get skeptical looks. It sounds so far from the conversations we have about operational efficiencies, priorities and performance that it may sound unrelated or even hokey. But really, giving permission to be human is a reference to the fact that as humans, we all have a set of natural strengths and natural weaknesses, and when we focus on developing and leveraging our natural strengths, we grow. If we focus on and obsess over our weaknesses and past failures, we become our own impediment to realizing our full potential. ure, creating and maintaining a culture in which mistakes are seen as career-enders and the high performers are expected to be flawless. These environments tend to be rigid, high-stress and low in morale, for starters. People wear a veneer of perfection but spend every day feeling like a fraud and waiting for others to find out. What happens to performance when people are afraid to fail? They hide things. They try to make themselves indispensable in other ways, which might mean hoarding information or work. And they’re afraid to innovate, to push themselves and others to take risks – all qualities that businesses (and people) need to grow. No one has ever ended the year saying, “I’m proud of how well we stayed exactly the same.” What I want to drive home is that failure gives you freedom – the freedom to experiment, to learn and to succeed. And when you embrace failure as a tool for growth, you will create acceleration and momentum personally and professionally. 3. C  HECK EMOTIONS AT THE DOOR. We aren’t machines devoid of emotion. But clear thinking that focuses on the task, rather than the emotion, is key to success. 1. IDENTIFY THE PROBLEM. Try to identify the type and severity of the problem. Is it a people issue, a limited resource, a communications problem, a time constraint, a deadline, a rule or a regulation? A problem clearly identified often leads to a solution. 4. M  ANAGE YOUR RESPONSES AND THINKING. When it looks like you might fail, a “silver lining” mindset could prove valuable. In the book “Happiness at Work,” author Srikumar S. Rao suggests asking two questions. 1. First, “Is there any possible scenario by which this (problem) could actually turn out to be a good thing someday?” 2. Second, “What can I – and my team – do to make this scenario come about?” These questions open the door to a different emotional, more pragmatic response, which can lead to innovative solutions rather than only dwelling on defensiveness. GEORGE SATULA George Satula is an executive leadership coach working primarily as a Vistage chairman, leading three CEO mastermind groups in southeastern Wisconsin. He is also a speaker and leadership development consultant. He can be reached at (262) 7867400 or George.Satula@VistageChair.com. 1. “Give power to your people.” Take a hands-off approach to leadership by allowing agile employees and teams enough autonomy to use their own judgments and follow through on tasks. 2. “Foster an entrepreneurial mindset.” Using the mantra, “If you were the owner, what would you do?” guide smaller, cross-functional teams to pursue original ideas, even if it ends in occasional failure. Advertise in these upcoming special reports and get your message in front of area business executives. Sign-up now for private riding lessons! Call for a Tour of our State-of-the-Art Resource Recovery Facility! Minimizing Waste to Maximize Our Resources! to get your market today! Variety, convenience and healthy foods… all at no cost to your organization! BizConnections NONPROFIT NONPROFIT ACADEMY OF WISCONSIN TO PROVIDE EDUCATION, SUPPORT FOR AREA ORGANIZATIONS A former chief executive officer of the now-closed Nonprofit Center of Milwaukee has launched a new organization to provide area nonprofits with educational programs and support. Rob Meiksins, a longtime nonprofit consultant who led the Nonprofit Center for two years until retiring in 2017, said the new Nonprofit Academy of Wisconsin is focused on supporting small- and mid-sized nonprofits. When he was still working for the Nonprofit Center, Meiksins said he realized there was a need for providing more “intentional” and uniform curriculum for nonprofits based on best practices in the sector. c alendar The Women’s Center will host its (em)Power Luncheon featuring Terry Crews in honor of Denim Day on April 24 at Potawatomi Hotel & Casino. The event will be held from 10:30 a.m. to 1:30 p.m. More information is available at twcwaukesha.org. Kathy’s House will host its annual gala on May 11 at 5 p.m. at Hilton Milwaukee City Center, 509 W. Wisconsin Ave. The event begins at 5 p.m. and will include a cocktail hour and silent auction, followed by dinner, program and awards, and a live auction. More information is available at kathys-house.org. Hispanic Professionals of Greater Milwaukee’s Five Star Gala will be held May 11 at The Pfister Hotel, 424 E. Wisconsin Ave. The event will feature musician José Feliciano as its keynote speaker. A silent auction, networking and cocktails will be held from 5-7 p.m., followed by dinner and the program, and live music and dancing with Lynne Jordan & the Shivers and N’Semble Latino. More information is available at hpgm.org. D O N AT I O N R O U N D U P Kohl’s Corp. donated $5 million to Children’s Hospital of Wisconsin in support of mental health services for children and families. | The Milwaukee-based Argosy Foundation has given $500,000 to the Milwaukee Ballet’s capital campaign in support of its new headquarters. | Milwaukee Habitat for Humanity has received a $200,000 grant from Wells Fargo in support of its three-year initiative to build or restore 100 homes in the city’s Midtown neighborhood. | The Citi Foundation and Local Initiatives Support Corp. awarded $190,000 to Journey House to help job seekers increase their incomes and improve their credit. | The Medical Society of Milwaukee County made a $100,000 donation to the Milwaukee County Housing First program to fund two part-time housing health navigators, provide on-site health screenings for the homeless and place Medical Society Board Members on the Community Justice Council. Susan Kim, Dipti Krishnan, Dawn Leader, Amanda Medina-Roddy, Cynthia Minuti and Peter Peterson. Is your organization actively seeking board members for the upcoming term? Yes, we welcome board applications from compassionate volunteers with a passion for our mission, and especially those with expertise in marketing and communications, fundraising and/or law. Ways the business community can help your nonprofit: Building awareness through participation in April’s Sexual Assault Awareness Month activities and October’s Domestic Violence Awareness Month activities; inviting us to speak to employees and/or civic groups about the issues and our services; sponsoring one of our events or providing a grant or corporate donation; hosting a drive to collect items on our wish list; bringing a team to our facility to volunteer. Key fundraising events: On Denim Day and as part of Sexual Assault Awareness Month, The Women’s Center hosts its largest event, the (em)Power Luncheon, this year featuring Terry Crews on April 24. In fall, TWC presents A Noteworthy Evening, a night of notable flavors, sights and sounds, this year at Historic Courthouse 1843 in downtown Waukesha with access to Waukesha’s own Les Paul exhibit, to be held on Nov. 14. Dennis Snider brings 25 years of experience in the commercial security technology industry to Engineered Security Solutions, Inc. and joins ESS at a time of unprecedented growth. Dennis began his career in security on the technical side and has held various positions in service and management. Prior to that, he served our country in the United States Air Force. Dennis will be an integral part of the leadership team as Operations Manager. Lorne Tappa has been promoted to NRC’s VP of Finance & Administration. Since 2008, Lorne has been instrumental in NRC’s 300% growth, as well as our automated on-boarding process, training reimbursement program, and competitive healthcare benefits. Laura Schmidt is the director of corporate relations at MSOE, where she will build and maintain strategic relationships for the university while exploring ways in which faculty, staff and students can complement the needs of interested organizations. Jeff Costakos has been named chairman of the Intellectual Property Litigation Dept. at Foley & Lardner, LLP. He previously served as vice chairman of the practice group. ESS is a Wisconsin security leader providing cutting-edge solutions for commercial, industrial, municipal, law enforcement, education, financial customers and more for nearly 20 years. Kadie Jelenchick, a partner at Foley & Lardner LLP, has been named vice chairperson of the firm’s IP Litigation Practice Group. She previously served as chair of the IP Department in Foley’s Milwaukee office. David Luettgen has been named chairman of the Intellectual Property Dept. in the Milwaukee office of Foley & Lardner LLP. New Hire? Share the news with the business community! Announce new hires, promotions, accolades, and board appointments with BizPeople. Visit biztimes.com/bizconnect to submit your news! Springman LLC, W237 N6587 Orchard Drive, Sussex, $14,400, U.S. Bank; Strive Chiropractic LLC, 19555 W. Bluemound Road, Suite 6, Brookfield, $150,000, Waukesha State Bank. Water Street This historic photo shows the original Milwaukee streetcars on North Water Street in downtown Milwaukee. City Hall is visible in the background. On the left side, an advertisement for First National Bank is on the side of one of the buildings. Now known as The CityCenter at 735, the building was constructed in 1914 for the bank, which is now part of U.S. Bank. — This photo is from the Milwaukee Public Museum’s Photo Archives collection. NAIOP Wisconsin recently hosted a celebration at the Central Standard Craft Distillery in Walker’s Point, in honor of being named the NAIOP Chapter of the Year and chief executive officer Jim Villa being named NAIOP Executive of the Year. TRAVIS PETERSON of Kapur & Associates, DAVID JORGENSEN of VJS Development and JIM SEDGWICK of Colliers International. RYAN TROST of Phoenix Investors, KEN WEIN of Key Engineering, ROBERT HABICH of Davis & Kuelthau and THOMAS MAAS of Landmark Credit Union. BRITTANY YINGLING of NAIOP Wisconsin and ANITA MAHAMED of Wipfli. JIM VILLA of NAIOP Wisconsin, ROBERT HABICH of Davis & Kuelthau and SHAWN CAVIN of First American Title. JEFF WHIPPLE of Interstate Partners and JASON KORB of Korb + Associates. REID SPIERING of Core 4 Engineering and DANA LELAND of Brothers Interiors. BRITTANY YINGLING of NAIOP Wisconsin, JIM VILLA of NAIOP Wisconsin, BRIAN ADAMSON of ICAP Development, SCOTT LANGLOIS of Quarles & Brady and JEREMY FOJUT of NEWaukee. BizTimes Media recently hosted its Executive Forum at the Italian Community Center in Milwaukee’s Historic Third Ward. MIKE MATERA of RF Technologies, DAN PETERSON of Valuation Research Corp. and SEQUOYA BORGMAN of Borgman Capital LLC. 10. ROBERT GROSS of Gross Automation LLC and JIM BERNTHAL of Top Floor. 11. BETH BORST of Park Bank and PADDY KIECKHEFER of BizTimes Media. 12. MICHAEL MANIACI of FarWell Project Advisors and TROY BARTOSHEVICH of Park Bank. 13. MARK HENSCHEL and ASHLEY MUELLER , both of Park Bank. Recruit tomorrowâ&#x20AC;&#x2122;s workforce Changing the image of careers in manufacturing and the skilled trades in Wisconsin. Space reservations now open for STUFF SE Participate in the 3rd annual edition of STUFF Made & Built in SE Wisconsin to raise awareness and recruit employees â&#x20AC;&#x201C; going directly to junior high, high school and college students as well as workforce centers throughout the region. THESE COMPANIES ARE HIRING! Thank you to our 2018 profile participants!